The Grand Rapids Griffins are heading to the Calder Cup finals for the second time in franchise history, and have a chance to capture their second Calder Cup in five seasons. They won their first championship back in 2013 against the same Syracuse Crunch they will begin to play against this weekend. In this week’s edition of The Grind Line, the Detroit Red Wings writers offer their thoughts on the Griffins’ current playoff run. We discuss standout players, disappointments and potential future implications for various Red Wings prospects. The Grand Rapids Griffins’ playoff run isn’t terribly surprising. What is surprising is how they are steamrolling the competition. In 13 playoff games, the Griffins have lost only twice, including winning all seven games at home. In addition to getting quality goaltending from Jared Coreau (.922 save percentage, ranked No. 1 of all goalies with more than 10 games in the AHL during the Calder Cup playoffs), the Griffins have four lines that have the ability to score. Ben Street, Eric Tangradi, Tomas Nosek and Tyler Bertuzzi each are scoring at a point-per-game pace or better, and fourth-liner Matthew Ford is scoring 0.69 points per game. The amount of depth shows when the Griffins opt to sit prospects Vili Saarijarvi, Givani Smith and give limited playing time to Axel Holmstrom and Filip Hronek. I’ve been impressed with Nosek’s play during these playoffs. He’s starting to establish himself as a top-line center in the AHL. If the Red Wings can avoid signing any free agents and possibly trading a player or two, Nosek could slot in as a third-line center next season. Dominic Turgeon hasn’t been putting up the points he did when he was in the WHL, but he has been a key penalty killer for the Griffins, helping Grand Rapids to the second-best PK percentage (86.2) of all teams playing at least 10 games during the playoffs. Despite a rough outing for the Red Wings this season, fans can take solace in the future looking bright. The Grand Rapids Griffins are off to their second Calder Cup appearance and have lost just two games en route to the finals. Players are firing on all cylinders, as the Griffins are receiving help from all four lines. Ben Street (15), Eric Tangradi (15), Tomas Nosek (14) and Tyler Bertuzzi (13) have chipped in as point-per-game players for the Griffins during their playoff run. As impressive as their offensive contributions are, the latter two names should pique the interest of Red Wings fans heading into next season. The team should have a number of spots open at the forward position, and one of (if not both) Nosek and Bertuzzi could push his way into the lineup. Coreau’s play in net is encouraging, despite his struggles at the NHL level this season. Through 13 games with the Griffins, he has posted a 2.41 goals-against average and .922 save percentage. If the rumors are true, general manager Ken Holland is working the phones, looking to deal one of Jimmy Howard or Petr Mrazek. If Coreau can finish the Griffins’ playoff run on a high note, it could give Holland the push he needs to move one of his goaltenders. While he has not produced to the level of some of the aforementioned players, rookie Evgeny Svechnikov has shown plenty of promise during the postseason. He’s collected nine points through 13 games, and perhaps even more importantly, gained valuable playoff experience during his first season in the AHL. If only the Red Wings could win like the Griffins – Grand Rapids has only lost twice en route to the Calder Cup Finals. They’ve received contributions up and down the lineup from future Red Wings, with a few players standing out in particular. After finishing the regular season with the Red Wings, Nosek rejoined the Griffins just in time for the 2017 AHL Playoffs. The hulking Czech forward now co-leads the team with seven goals in 13 playoff games. When you consider his size, overall playoff performance, and 41 regular season points in 51 AHL games, Nosek has a solid resume worth considering for a full-time NHL gig next season. It’ll be nice to have some scoring touch on Detroit’s fourth line. While Coreau has won 11 games and lost just two these playoffs, there’s still room for improvement in the Calder Cup Finals. Some of the goals he’s allowed so far have been soft – something he can’t afford to let happen next season if he’s in Hockeytown as the backup. Unscreened shots from the top of the circles can’t be going in at the AHL level, let alone in the NHL. Overall, this is a great experience for Detroit’s future Red Wings. 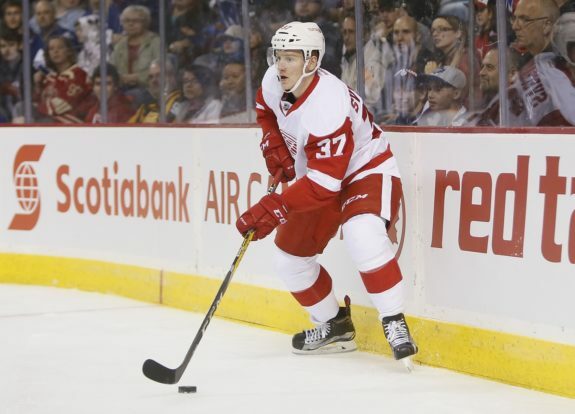 Strong performances deep into the playoffs bode well for the likes of Nosek, Bertuzzi, Svechnikov, and Joe Hicketts, who will be competing for NHL spots in the fall. In addition, having Hronek and Holmstrom get into a few games is fantastic for their development, even if they’re a few years away from reaching the NHL.